Every day a student is absent is a lost opportunity for learning. Too many absences not only can affect achievement for the absent student but also can disrupt learning for the entire class. 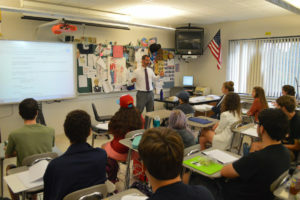 Because attendance is so important, and in response to increased accountability measures under the Every Student Succeeds Act (ESSA), the East Greenbush Central School District is launching Attendance Matters to improve student attendance in all of its schools. Bringing awareness to the issue of chronic absenteeism, and providing information and resources to parents can help improve student attendance and, consequently, student achievement. It is important that children come to school each day to build a healthy academic and social skills routine. Children thrive best with a daily routine which benefits their willingness to learn and become part of their classroom community. New material is learned every day in class. If a student is missing class on a regular basis then significant gaps in student knowledge can develop quickly, and this will severely limit a student’s ability to be successful academically. There are ample amounts of research documenting the direct correlation between school attendance and academic achievement. We, like all school districts, are closely monitoring our attendance to ensure students are in school and learning with the goal of preparing for college and careers. Attending school daily not only gives students access to education through books, but it also is a social networking opportunity, to learn skills for real life experiences beyond books. Regular attendance fosters a classroom community between teachers and children. Students who attend school are more likely to succeed academically. Students gain background knowledge from discussions while learning in school. Attending school also provides time for social interactions with peers. Every day matters. You are more likely to succeed if you attend something consistently. Each day is an opportunity to get better, if you are not in school you sacrifice that chance at improving yourself. You know what you’re doing because you learned to do it. The more you learn the more you can do. What is Chronic Absence and What is its Impact? Most children miss a few days of school each year without long-term consequences. However, when they miss many days, the effects are almost always negative. Researchers have defined absences as “chronic” when they reach the level at which a child’s school success is at significant risk. Chronic absence has been established when a student misses 10 percent of school days, and it is different from truancy, which counts only unexcused absences. In the East Greenbush Central School District, students are considered chronically absent when they miss 18 school days a year for any reason (10% of our 180 school day calendar). That works out to less than 2 days per month. Over the course of a student’s high school career, missing 10 percent of school days would equate to missing almost an entire semester of school. Over 7 million U.S. students (1 in 7) miss nearly a month of school each year. Research shows that missing 10 percent of school days, or about 18 days in most school districts, negatively affects a student’s academic performance. That’s just two days a month and that’s known as chronic absence. What is the 'Attendance Matters' Campaign? Attendance Matters is a campaign to bring awareness to the issue of chronic absenteeism. This involves the school district reviewing attendance data, creating strategies to improve attendance and providing information to our families. Attending school regularly helps children feel better about school—and themselves. Start building this habit in preschool so they learn right away that going to school on time, every day is important. Good attendance will help children do well in high school, college and at work. Parents can view their child's attendance on the Parent Portal by logging into PowerSchool. Click here for directions.